Wild Turkey has taken some flack lately. While I do believe they have stalled in the realm of creativity (Diamond Anniversary is good but doesn’t hold weight with the likes of developments at Four Roses, Heaven Hill, and Buffalo Trace), they consistently put out their regular line-up with great results. Your grandfather might have drunk this very dram but it is by no means a nasty, old man’s pour. This is one fine tipple. Medium-to-dark copper. An orange tint. Vanilla is the first thing I get here. Then, it is quickly followed by a ton of carmel. This is a very spicy bourbon. You can tell it is a high-rye mashbill. Some barrel char notes and alcohol burn. When water is added a lot of sweet honey notes appear. For me, it gets almost too sweet. I like this one neat. Sweet carmel is the first note. Loads of sugar. This is followed by vanilla and some cherry fruit leather. This is a very smooth yet thick tipple with a decent, but not too strong burn. You know it’s there. Again, honey is added to the palate with the addition of water. And, yet again, I find it too sweet. I like this one neat when it comes to the taste as well as the nose. Long. This one stays with you for a while. It goes from carmel and fades into some oaky notes. I absolutely love this pour. It is by no means gut-rot. This is an everyday sipper in my opinion. And, while I prefer my whisk(e)y neat, this would make a mean cocktail. I was first introduced to this bourbon last year by a good friend. I liked it immediately. So, I recently picked up a bottle. It didn’t take me long to finish it and I doubt it will take me long to replace it. This will be a staple in my bar. This is a corn-forward whiskey. You also get notes of carmel and granny smith apples. It is unique. Granny smith apples dominate the palate. Too much so in my opinion. Some might really like this taste. It is a little too overpowering and unbalanced for my taste. However, there are some subtle hints of vanilla and carmel which were more present on the nose. Medium. Some smooth and sweet tobacco notes. It is closed out by apple crisp. It is not bad. It is not great. It is unique. The nose is the best part. I was a little let down by how much the granny smith apple notes dominated the palate. If this is your thing then you will love this tipple. It it is not, then I would recommend passing on a bottle and trying a pour. Carmel and vanilla forward. Fresh baked donuts. A little apple in the background. Much smoother than the original. Carmel and vanilla again. Very doughy. Smoke and pepper. A little apple again in the background. Medium. Smooth and creamy. I was left with the taste of a carmel apple fritter. Surprisingly, this is much more balanced than the original. It is smooth and creamy. It puts the apples in the background and without losing them allows the classic bourbon notes of carmel, vanilla, and a bake shop to shine through. This was a fun experiment and I think I will try some other types of infusions in the future. Please leave a comment on what type, if any, infusions you have tried. Real maple. Not much smoke. Not too overpowering. Some small hints of oak in the background. Not as bad as I expected. Really sweet. Lots of maple. And, fake maple here. The nose is deceptive leading one to believe the taste will follow suit. You can kind of tell it is bourbon but all I get is maple syrup with a slight alcohol burn. This is an unpleasant drink. Buying a whole bottle was a mistake. I should have stuck with getting the cocktail next time I was at the pub. If you can find this in a cocktail it might be worth a try. If you like torture then you could always buy a glass at a bar but I wouldn’t pay more than a few bucks for a try. It is classic Maker’s cranked-up to the max. All the normal notes are there but they are stronger. Carmel, toffee, vanilla, red fruits (dark cherries), a slight brown sugar and barrel char note. An even smaller but, still present, oakiness. It reminds me a lot of WT 101 but smoother and fresher. This is very smooth and creamy for its proof. The burn is on the front and sides of the tongue. Even so, it is not too hot. It has a medium viscosity. Most of the notes from the nose come out in the palate as well. Carmel, toffee, vanilla, red fruits (dark cherries), and a small amount of brown sugar. Medium. Smooth. The red fruit notes and sweetness lingers and then fades to a dry, slight oakiness. I feel this is just slightly over priced. If it was in the $50-55 range it would be perfectly positioned. There are some good options in cask strength bourbons in that range. This is truly a great tipple. But, it wasn’t at first. Time has done this one well. I remember not liking it too much when I first opened it. It did not fare well in a blind tasting of cask strength/barrel proof bourbons. Air and a few months has really helped smooth it out and open it up. I love it. It is a great batch. It will be a staple in my bar again. Maker’s is back! 93/100 (An Excellent Tipple) – It would be 94-95 if the price was a little lower and the palate was a little thicker. *Disclaimer: This bottle was a gift from a friend so I did not have to pay the price listed. So, I guess this bottle could have been rated at a 95 or higher since it was free for me. Chocolate covered cherries, oak, and varnish lead-off. Some caramel enters soon after. There is a slight alcohol burn (I always get more when I smell through my left nostril than when I smell through my right one). Butterscotch and burnt sugar enter in and mingle throughout. It reminds me of eating Werther’s Originals with my grandmother. There is a general spice smell at the end. Maybe cinnamon and/or nutmeg. Spicy and sweet. Cherries and chocolate. Slight butterscotch and caramel in the background. The oak permeates throughout but is not overpowering. This is fairly well-balanced compared to what I had heard and therefore expected from this young gun. This is a well-priced bourbon. While I don’t think I would have said this a few years ago, in the age of bourbons entering the market at $50, to be able to get an uncut, unfiltered little giant like Stagg Jr. at the same price point is a good deal. Of course, I’d love it to be in the $40 range. But, I would buy this one again for sure. If I can find another when I am done with this one I will be sure to pick it up. This is a mighty fine tipple. It brings tons of flavor, a good amount of bite, is fairly well-balanced, and decently priced. I could not ask for much more. Except, maybe a shot at a bottle of the big brother at a decent price. For now, I will take this little guy and enjoy it until it is gone. Ethanol. Followed quickly by spice and a slight hint of dark fruits (blackberries). Some oak. This one has not opened up much over the past few months. It is an intense and not really pleasent nose. I don’t usually do this but I added a little water and it tamed down the ethanol slightly and brought forward the spice and caramel. Spice and oak. Followed by some sweet caramel and vanilla notes. Semi-dry towards the end. Not a bad thing. Just not overly dynamic. Water brought out the caramel, vanilla, and some nuttiness I did not get before. Long. Spice, oak, caramel, and vanilla. Slowly fades away. The finish is the best part. However, the water shortens it a bit. The value is okay. The price is pretty nice. It is a high-octane bourbon for under $20. Thumbs-up. It is not as dynamic or versatile as the likes of Wild Turkey 101. Thumbs-down. So, in the end, the value category is kind-of a wash with this one. This is a good bourbon. It is not a great bourbon. The nose is nothing great. The palate is okay. The finish is my favorite part. I wouldn’t drink this one straight even the the water makes it quite nice. For the same price I can get the WT 101 which is more dynamic, has more depth, and is much tastier. But, this is a solid mixer with a good flavor. So, in the end, this falls into the good tipple range. Dark honey with an amber/reddish tint. This one is astringent. I let it sit for 30 minutes and then drank it neat from a Glencairn glass and it still hit my nose pretty strong. Once I was able to work my way through the high-proof curtain I picked up a lot of corn sweetness. Some classic vanilla and caramel were also present. A slight bit of ripe banana lingered in the background. It was not as prominent as I have read in other reviews. This might be because it is most likely younger than it use to be a few years ago. I also get some red fruits and apples. It is a decent nose. Right away I get sweet corn and caramel. The sweetness tingles the side of the tongue and is quite unique and pleasant. Some rye spice comes in towards the end. Unfortunately, the rye is a little harsh. Think a raw grain taste. The finish is my favorite part of this tipple. It is medium in length, bordering on long. Rye spice, black pepper, oak, and char dominate. A slight bit of caramel mixes in at the very end. It leaves you with a fairly well-balanced mix of sweet and dry flavors. There is also something floral I cannot quite pin down. It might be a little soapiness but it is not really unpleasant. The value is good, almost great. It is my favorite bourbon in the price range of $10-15 bourbons. 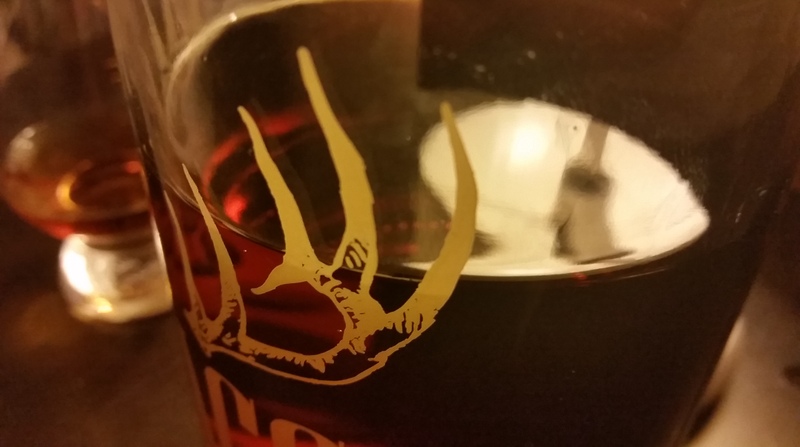 Unfortunately, it is held in the high-end of good because it is not quite as complex and pleasant as the closely priced Wild Turkey 101 (which I reviewed here). It is a good value sipper and a nice mixer for cocktails. I like this bourbon. It is my second favorite in its price range. It is versatile and pleasant. It is not quite as complex as I would like it to be. It is also only found in Kentucky (maybe some other parts of the South). So, it is held back a bit. Very little burn despite the proof. This one has a great nose. It starts out with a floral/vegetal scent. It reminds me of Four Roses’ F and Q yeast bourbons. It is quickly followed by caramel, toffee, and butterscotch. As it develops and opens up I get some vanilla and citrus. Towards the end I get some corn, rye spice, oak, and a very little bit of barrel char. The palate is note as dynamic as the nose but it is still really nice. I get caramel, rye spice, and vanilla. The finish is long. It is a continuation of the caramel, rye spice, and vanilla notes from the taste. The value is great. This is more dynamic and tastes better than the VOB BIB. While it costs a little more it is well worth it. It also makes a wicked cocktail. This is a staple on my bar. I really like this bourbon. It is relatively available, well priced, and very tasty. I would highly recommend it. It really only loses points in complexity and uniqueness. Buy yourself a bottle. TIP: I did a 50/50 mix of this and the VOB BIB and it was delicious. I would dare to say better than the individual parts. Worth a try.